Have you ever figured out how to do something that everyone seeming knew already? That’s how I feel about setting up a GP-C831 printer on a network. 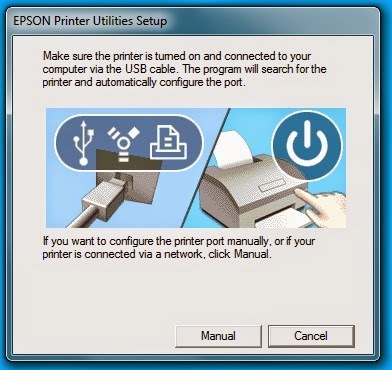 With the install Navi, it steps you through the process of adding a printer to the network, including discovering the printer. The Navi works great if the printer and the computer are on the “same” subnet. If the computer and printer are on different subnets, I have received various ideas on how to add the printer to the network; but I was never really confident about how to add a printer correctly. At the same time, I started using a new computer. Finally, I had to add the C831 printer to the office network in order to send out print samples. We send print samples to customers most every day. Not wanting to add the previous driver with the available Navi, I had to take a different tack. Now that I had the IP address, I had to configure a port for this printer. I added a port by right clicking on a printer, selecting the 4th option, Printer Properties, then selecting the Ports tab and Add Port using the IP address of the printer I set. 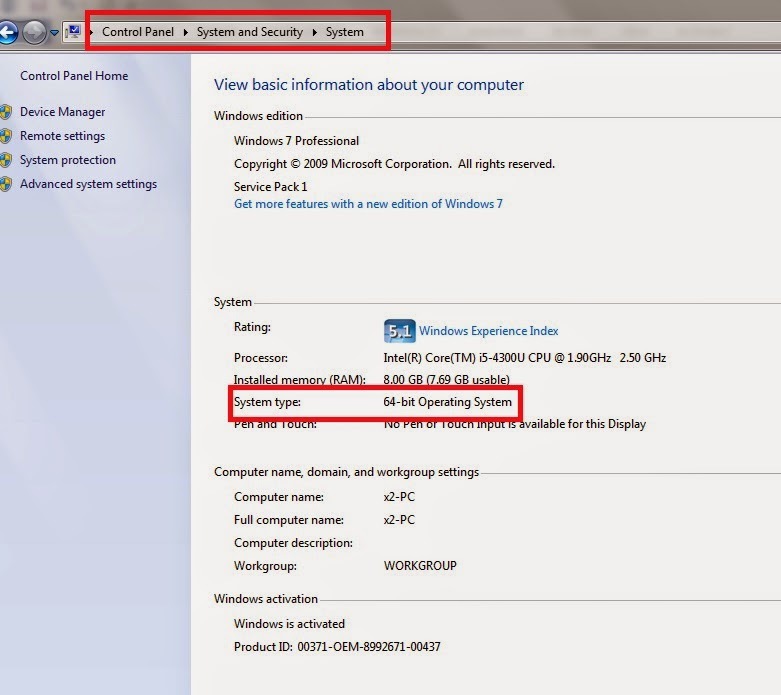 You need to know if your computer is 32 or 62 bit to select the correct driver. In the manual setup, you just need to select the available TCIP port that you configured earlier. And the printer worked great. 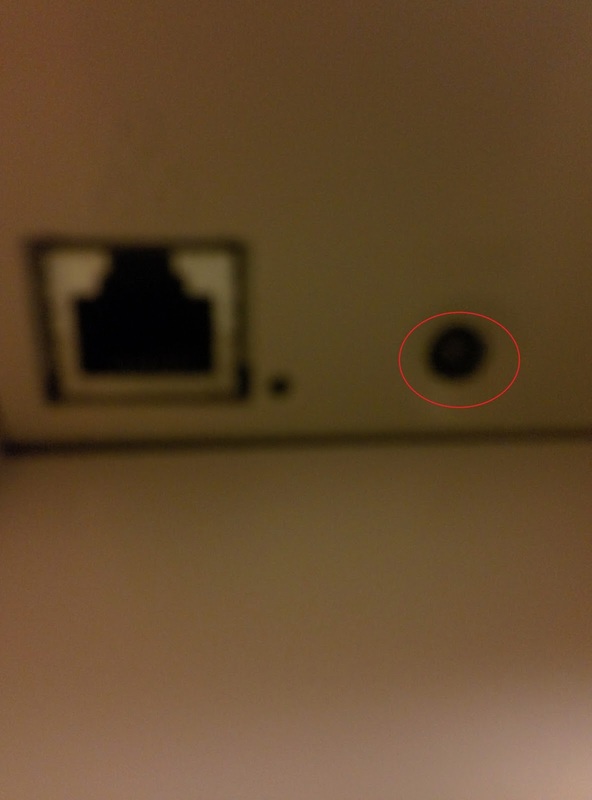 If you need the ID address of a TM-C3500 printer, press the button beside the Ethernet port at the back of the printer. FYI: access to the printer is password protected by a super-secret password, “epson”. 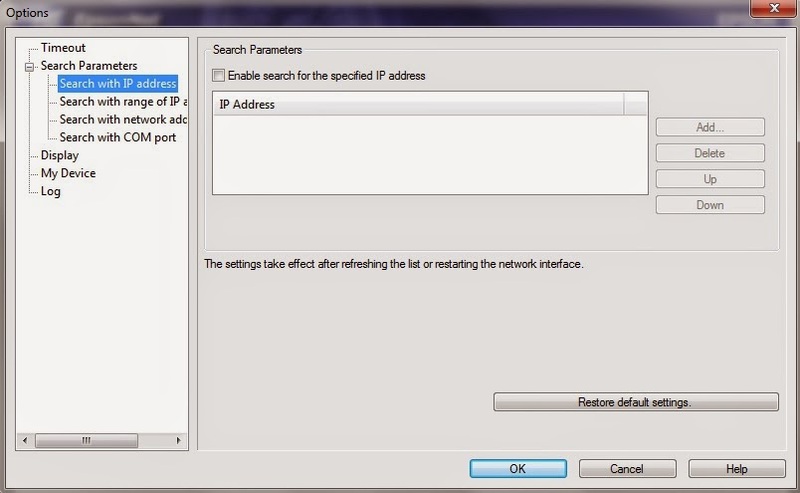 Clicking on “Network Setup”, enables you to change the IP address of the printer. 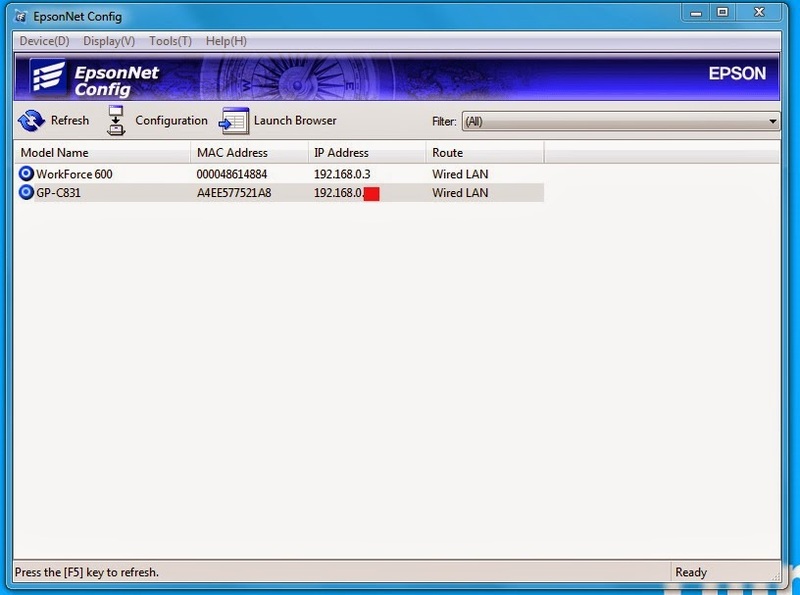 Or just add a port for this IP address as above. I was very excited to figure out how to add a printer to the network without the aid of the install Navi. Please remember while reading this post: I’m not a network expert. 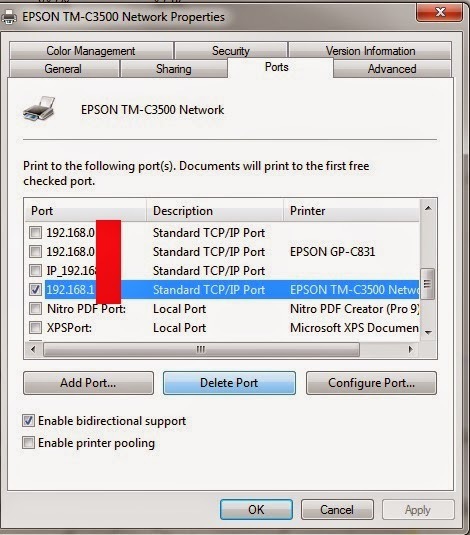 But the EpsonNet Config tool and knowing how to find the IP address can assist you in setting up a printer on even a complicated network. 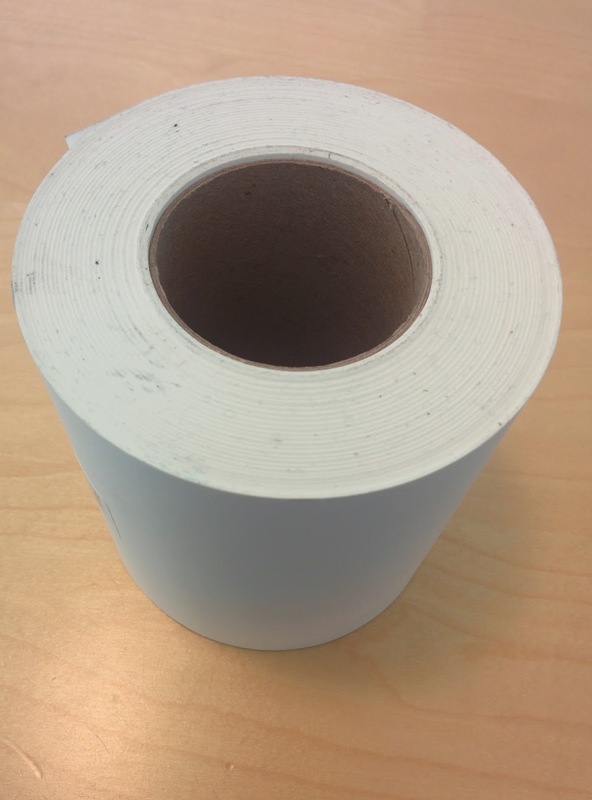 After selling and supporting hundreds of TM-C3500 customers, one question I get all the time is, “Can I use larger than a 4” Outer Diameter roll”? 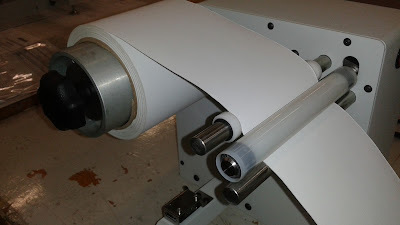 This question results from wanting to change the label roll less often or needing to print and then apply the labels with an applicator. With the C3500, however, you can’t use just any unwinder and rewinder. You may remember my post, Death By Inkjet: http://colorlabelsondemand.blogspot.com/2014/11/death-by-inkjet.html or my much earlier post on connecting a typical unwinder: http://colorlabelsondemand.blogspot.com/2012/05/unwinding-large-volumes-of.html. Traditional unwanders built for a thermal transfer printer may work; but may also not work so well. 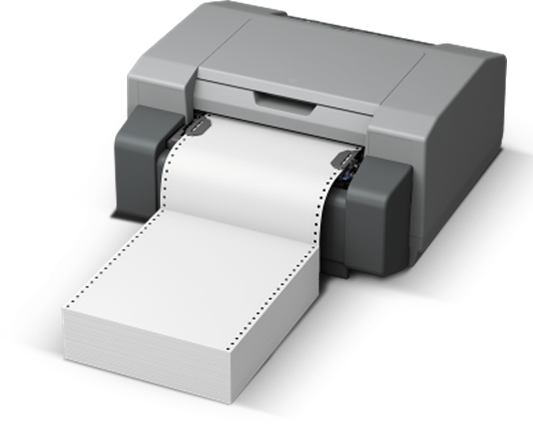 The C3500 printer uses a vacuum to hold the paper to the printhead; and not pressure like a thermal transfer printer. Therefore, you can't have any pull or tension on the labels going into or out of the printer. This unit has tensioners on the labels going into and coming out of the printer; insuring no tension is occurring on the labels in the printer as well as yielding a tight rewound roll. With my first encounter with the C3500-RTR, I found the setup a bit confusing. So here are my additional instructions on setting up this unit. Open the larger box first as it has all the parts, instructions and unwinder. In the smaller box, you’ll find the rewind unit, providing all you need to assemble the feed station. Then clip the wrap from the rewind cable to connect to the unwind. Insert cable from rewind into the unwind connector. Don’t force the connector. Rotate connector to the correct position. The connector should drop into the correct position. Then tighten the connector. Then lower the feet to have a flat surface. Use wrench to set the feet. 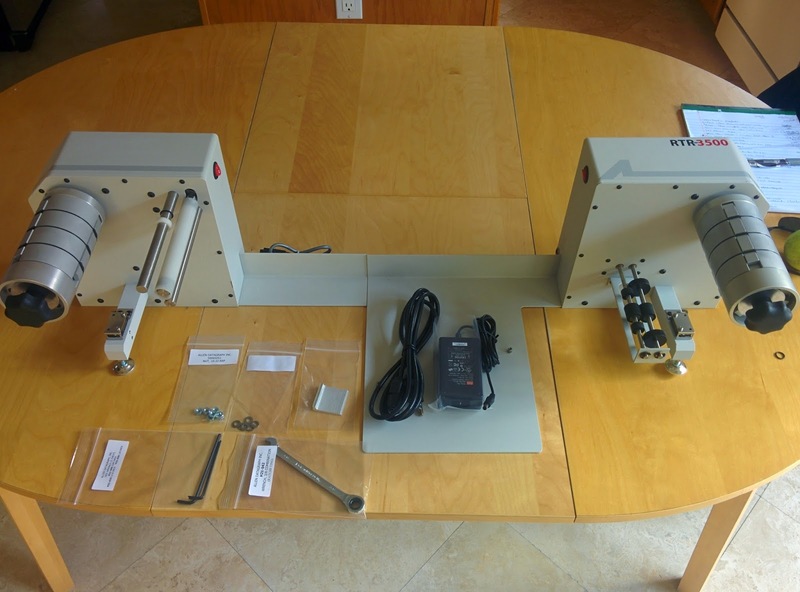 Now load the printer onto the pegs on the alignment plate between the unwind and rewind. Wiggle the printer to get the printer to set into the pegs. Or possibly better, get help to set the printer onto the pegs. Once set, you’ll have the printer in alignment ready to use. 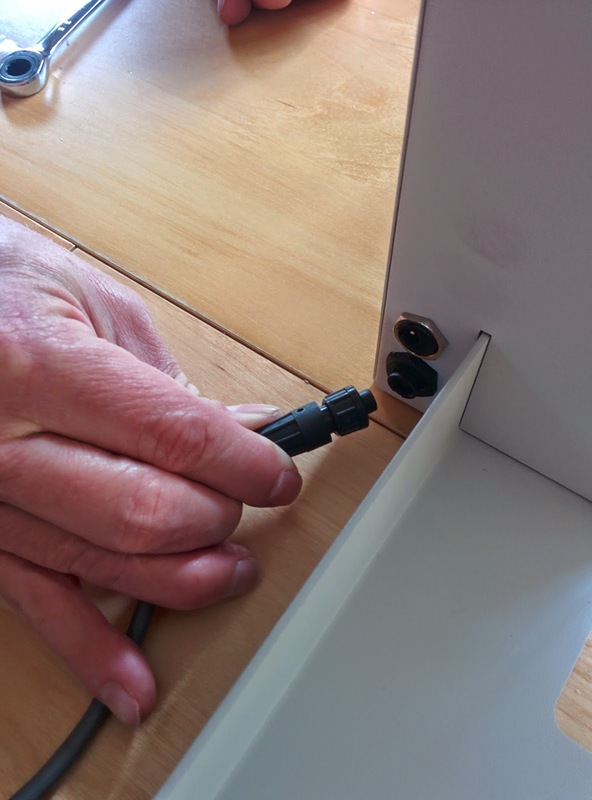 Then plug in the power and USB/Ethernet connections to the printer as well as plug the power into the unwinder. Once connected, you’ll see red laser light onto the back of the printer. 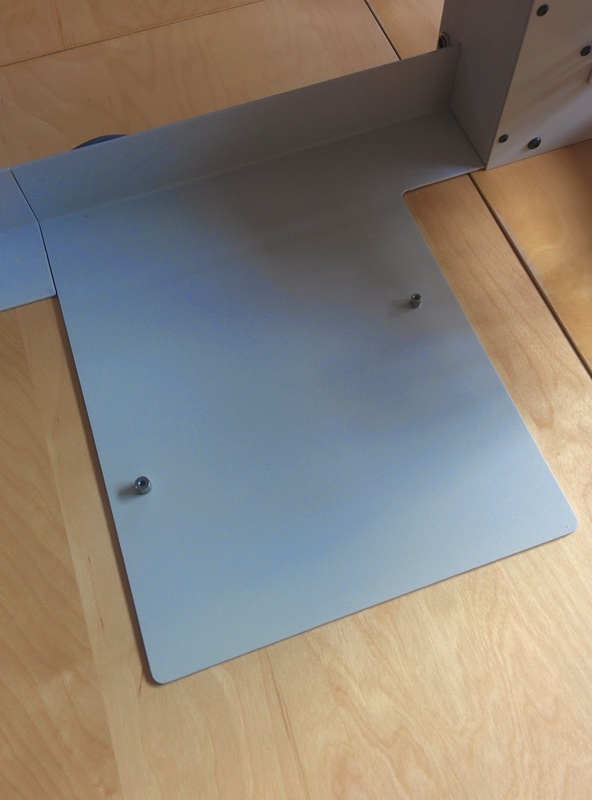 You’ll then place the optical sensor reflector onto the back of the printer. 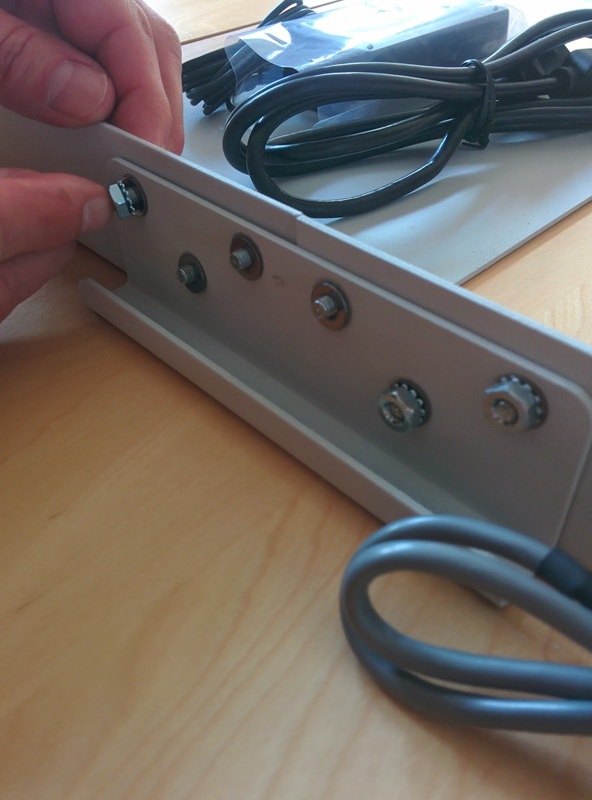 This optical sensor is what feeds the labels into the printer. 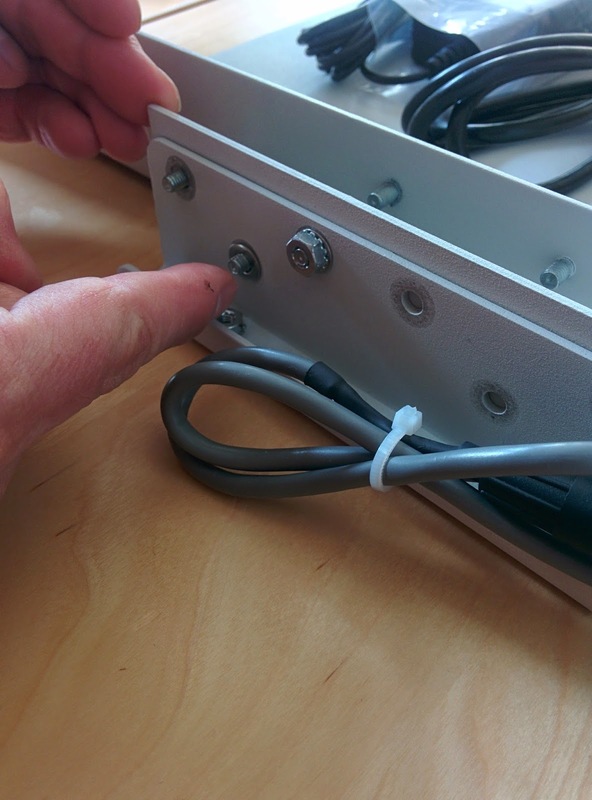 It insures the printer does not have to pull the labels into the rear feed slot. After placing the rear reflector, place the reflector tape on the front door where you see the red laser. And then in the “General” menu on the left, chose “Media Settings” and then select “Large Diameter Roll, Use Rear Feed Slot”. After selecting the rear feed option, be sure to choose the correct media detection settings as well as “Apply Settings”. 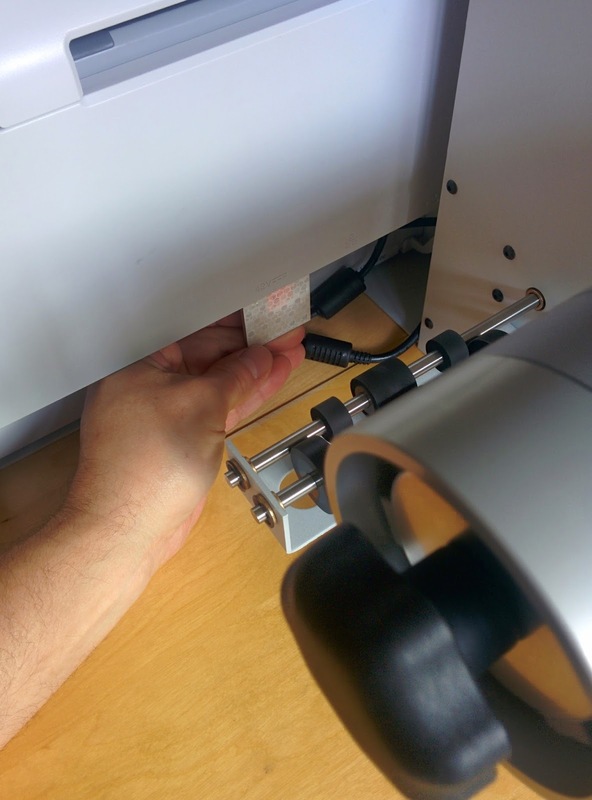 Once applied, you’ll need to turn the printer off/on as well as insert the clear plastic rear feed bracket (found inside the rear feed cover) inside the printer. 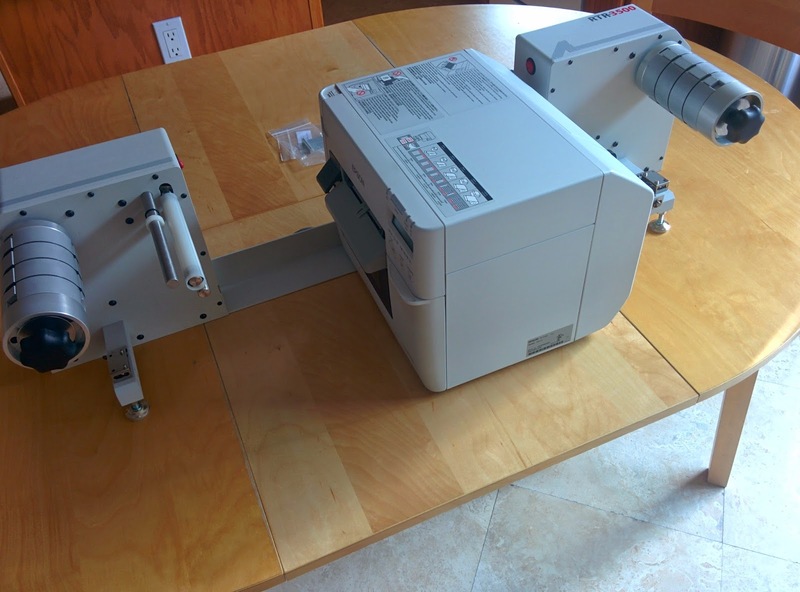 I reviewed in detail setting up the printer for rear feed here in this earlier post: http://colorlabelsondemand.blogspot.com/2013/11/3500-fanfold.html. Now you are ready to load a roll on a 3” core onto the unwind. To insure proper alignment, follow these steps. 1. Tighten up the roll of labels first. Place roll on the side on a table and pull the leading edge of the label tight. This step will minimize “telescoping” of the roll. 2. Loosen up the chug by turning the knob. Make sure springs along the chug are loose. 3. 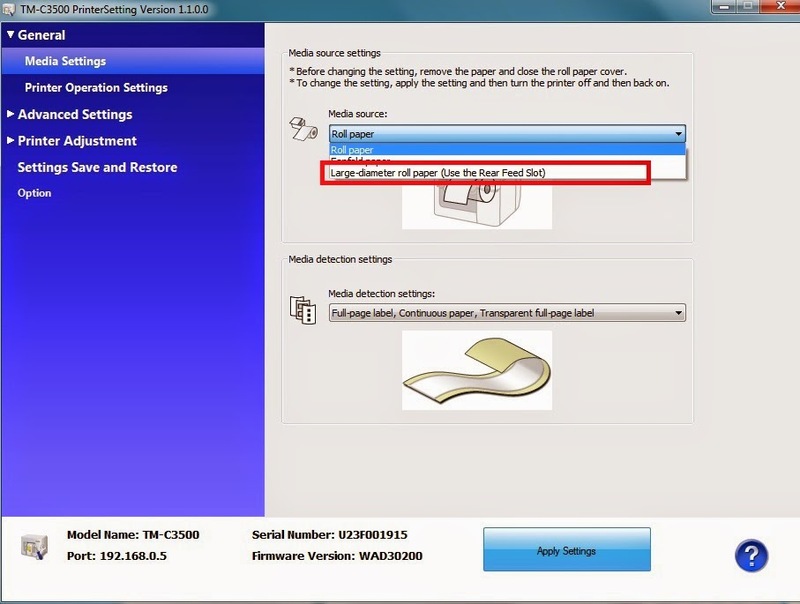 After placing the core on the chug, first feed the paper into the printer directly. This steps insures the paper/roll is straight into the printer. Once straight, tighten chug. 4. 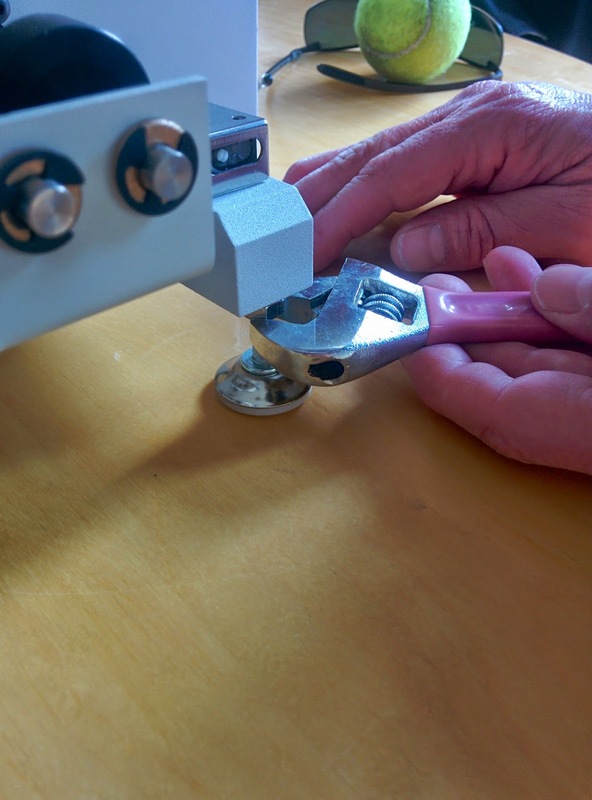 Loosen the media guides at the end of the rollers using the supplied hex wrench. 5. Feed label through the feed rollers (the two center feed rollers are glued to the shaft) by placing the leading edge of the label between the feed rollers and use your fingers to spin the rollers/feed the label through the feed rollers. This step helps insure the labels are fed straight. 6. Feed sufficient material through the feed rollers and pull back toward the unwound roll. Then you can again measure to insure the roll/leading edge is straight. 7. Set end media guides on the sides of label using the hex wrench provided. 8. Feed material to reach the printer. 9. 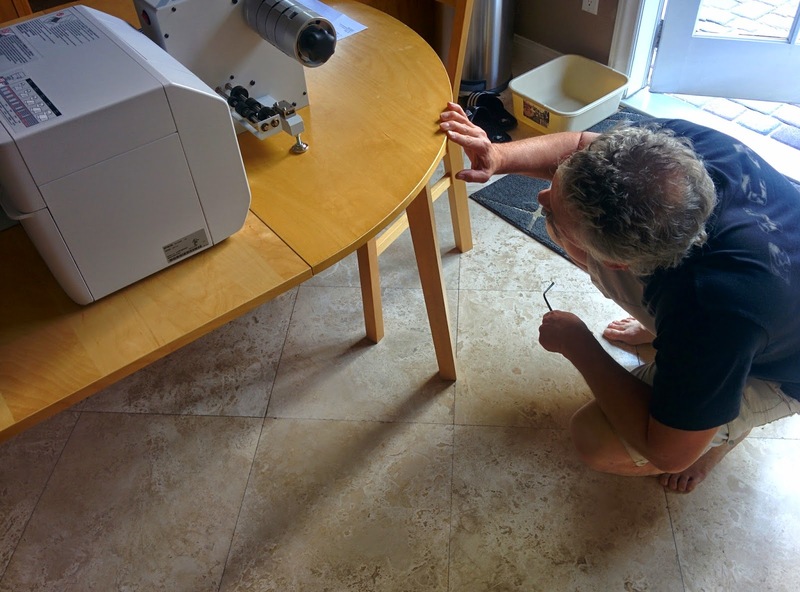 Once confirmed core/labels are straight, mark chug with a pencil to show where to place the next roll. Once the printer is loaded, I would recommend printing a few labels; then feeding the printed labels through the tension rollers for the rewind. 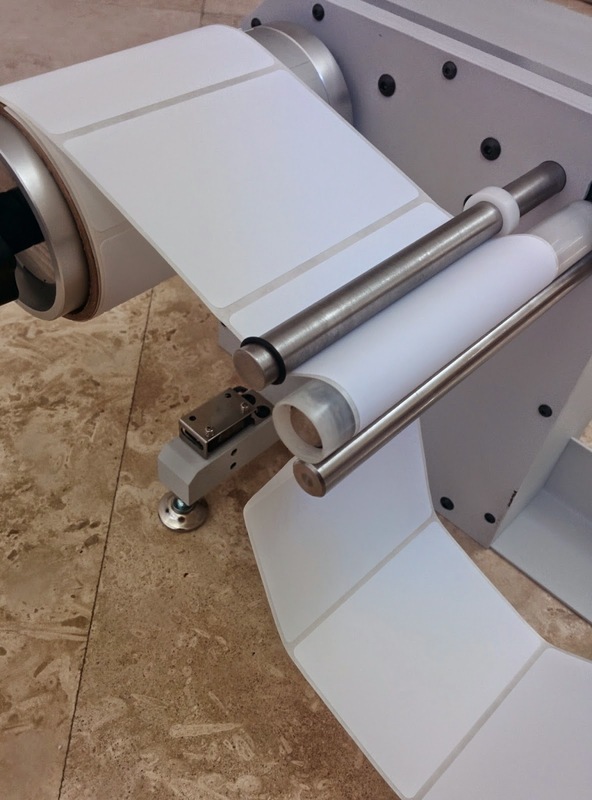 The C3500-RTR Feed Station makes it easy to print and rewind large rolls using the C3500 printer. 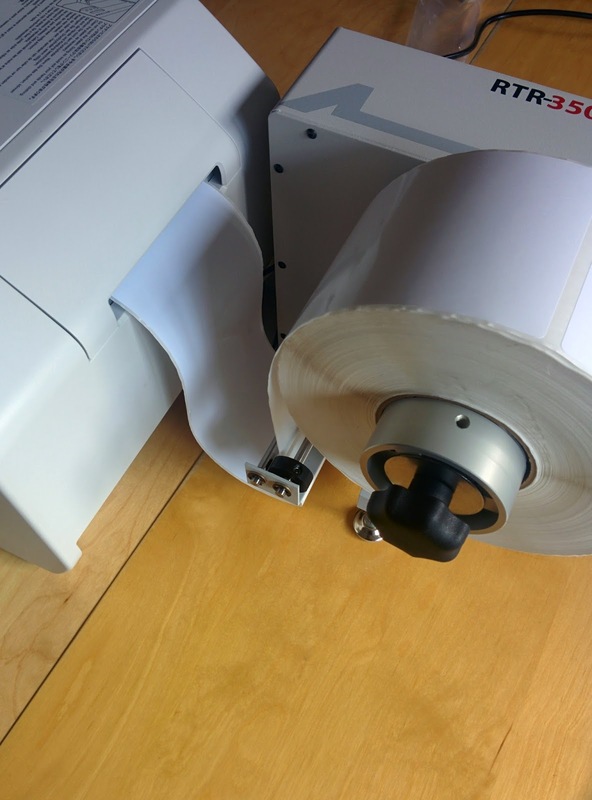 If you want the convenience of changing rolls less frequently or need to rewind printed labels to use on an applicator, I recommend you contact us to get this device. You’ll save time and trouble printing large label runs. Have you ever had a deja vu experience? 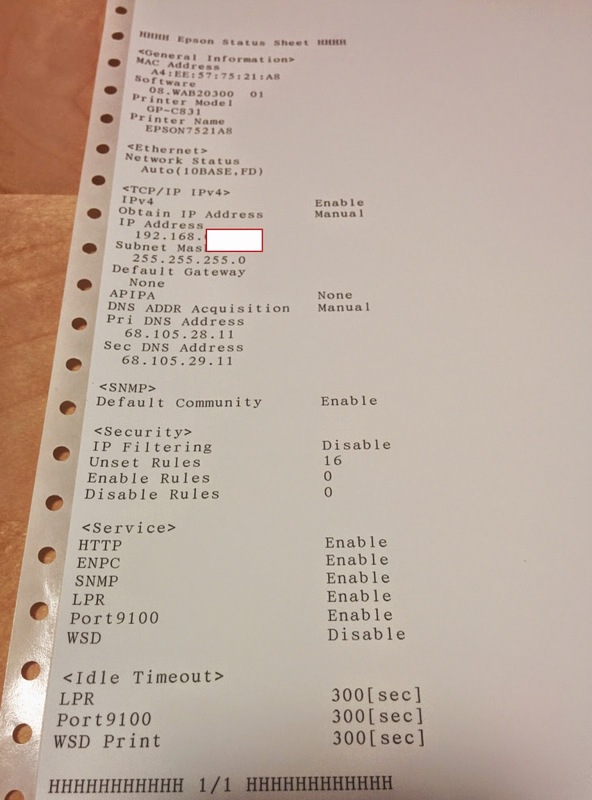 This week I remember something concerning the GP-C831 printer; but only a portion. The problem was, I forgot the most important part of the memory. Let me explain. For those of you who don’t know, the GP-C831 has quickly become the standard for printing GHS drum labels. With extremely durable (BS5609) ink and available label media (http://colorlabelsondemand.blogspot.com/2013/10/ghs-label-comparison.html), the most cost effective ink prices (http://colorlabelsondemand.blogspot.com/2013/12/trust-me.html), and the lowest cost (http://stores.colorlabelsolutions.com/gp-c831-8-4-color-label-printer/), the C831 is the best choice for producing GHS labels wider than 4.25”. You might find this recent post covering one company’s experience starting to use the C831 of interest: http://colorlabelsondemand.blogspot.com/2015/01/dyeing-for-ghs.html. Or the first post covering this printer on our blog just before launch: http://colorlabelsondemand.blogspot.com/2012/10/gp-c831.html. 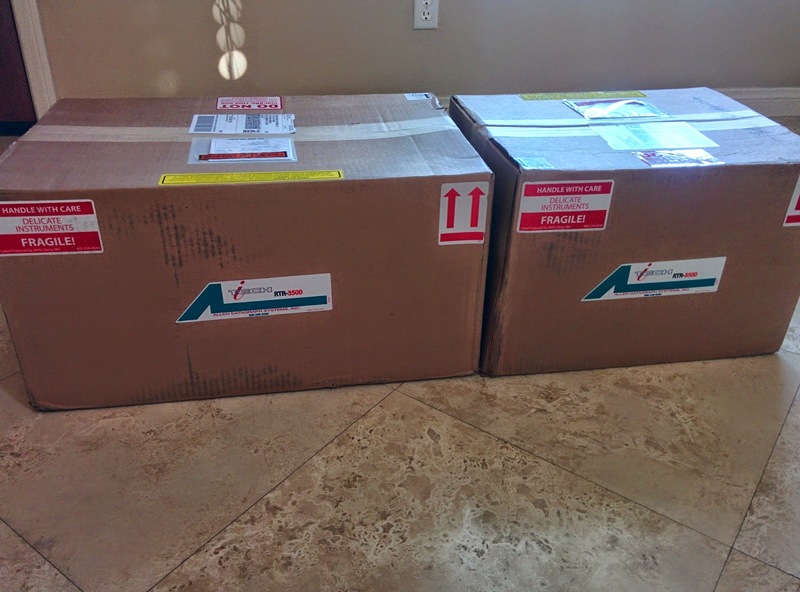 This memory started when a customer purchased one of our labels for the GP-C831 printer; an 8.3125” x 5.75”. 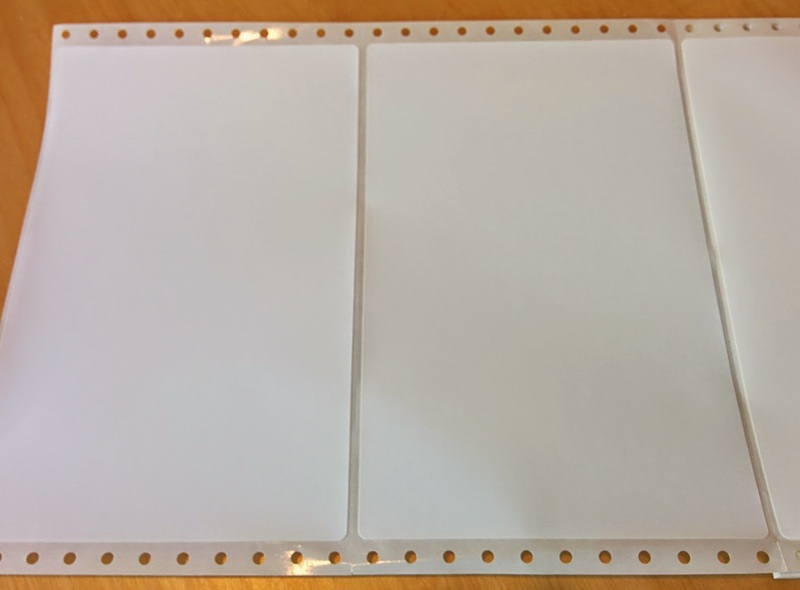 Two A5 labels per fold. After purchasing the labels, the customer asked me about configuring the printer. 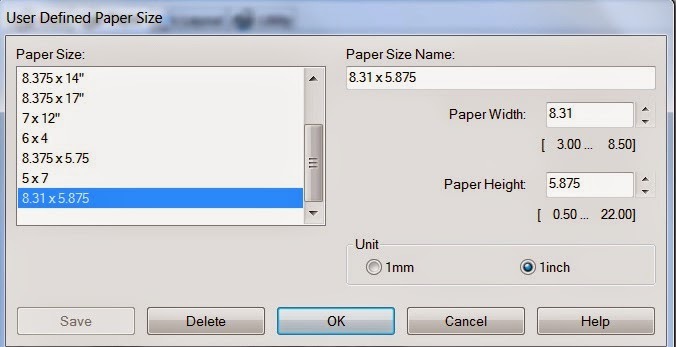 You may remember from my recent post about the new GP-C831 driver (http://colorlabelsondemand.blogspot.com/2014/11/gp-c831-surprise.html), you need to set the size of the label using the width of the actual label by the length perforation to perforation. The problem is the GP-C831 driver shows only the length up to two decimal places. 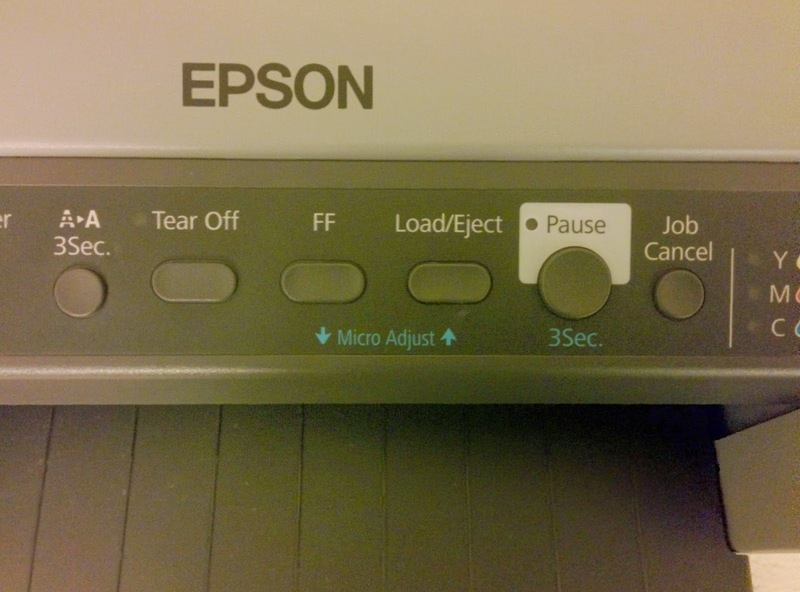 However, I “remember” that Epson had changed the driver to enable up to 3 decimal places. What compounded my issue configuring the driver was the plant said the 2 labels were 11.625”, making the each label 5.8125; requiring 4 decimal places. 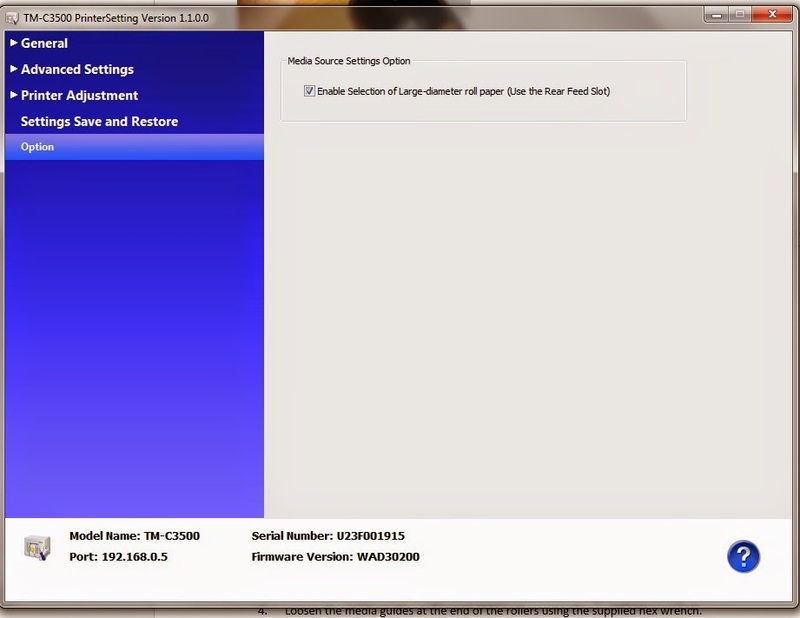 Suddenly, I had no idea how to configure the driver. So I had to call first the plant. Then I learned the perf to perf measurement was really 11.75” and not 11.625”; making each label 5.875”. Second, I had to call Epson, who reminded me that the driver now allows for settings up to 3 decimal places only at 1/8” of an inch. This 1/8” is critical to prevent label “creep”. 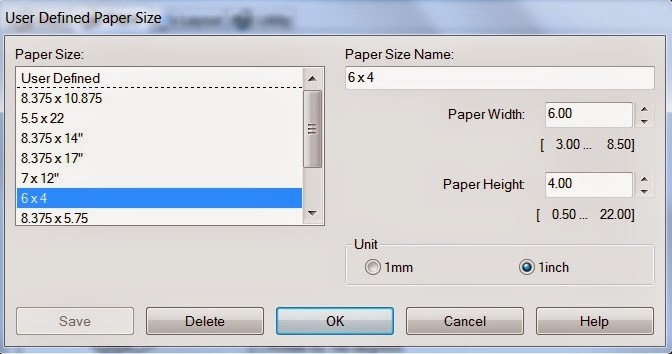 With only a minor incorrect setting, the label print will begin printing incorrectly; and not at the top of form. 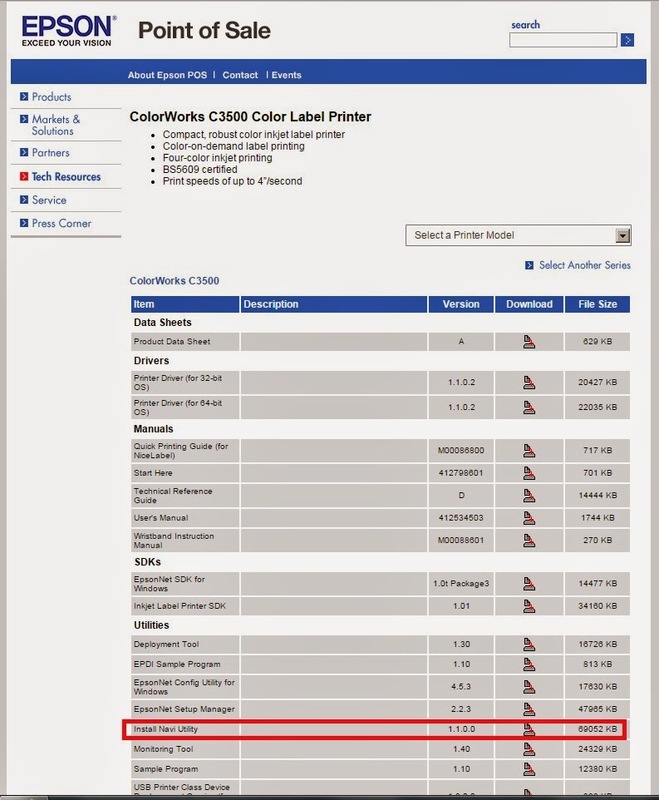 If your image seems to move off of center after printing a few labels with the GP-C831, you probably have the incorrect page size set in the driver. As soon as I was told about the settings for 1/8th, I “remembered” the details of the change from some time ago. It was deja vu all over again. Then, I could support our customers using this specific label size. 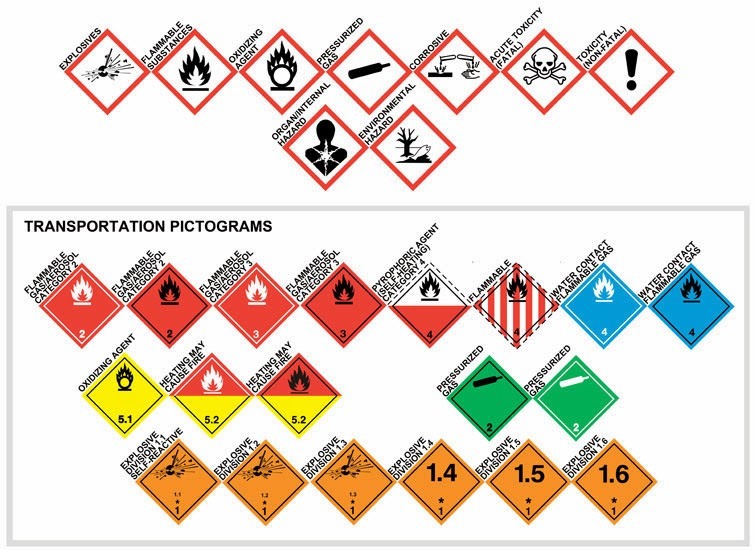 If you want to use labels for the GP-C831 that are approximately 8” x 5.75”or one of our other standard sizes, visit our store http://stores.colorlabelsolutions.com/gp-c831-pin-fed-labels/ or contact us. We’ll be glad to help you get the labels you need; and the support you deserve; again and again. Kinda like déjà vu!